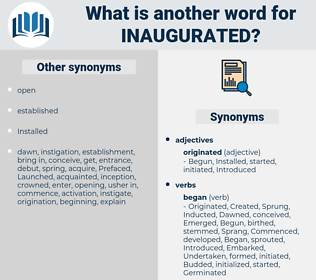 What is another word for Inaugurated? 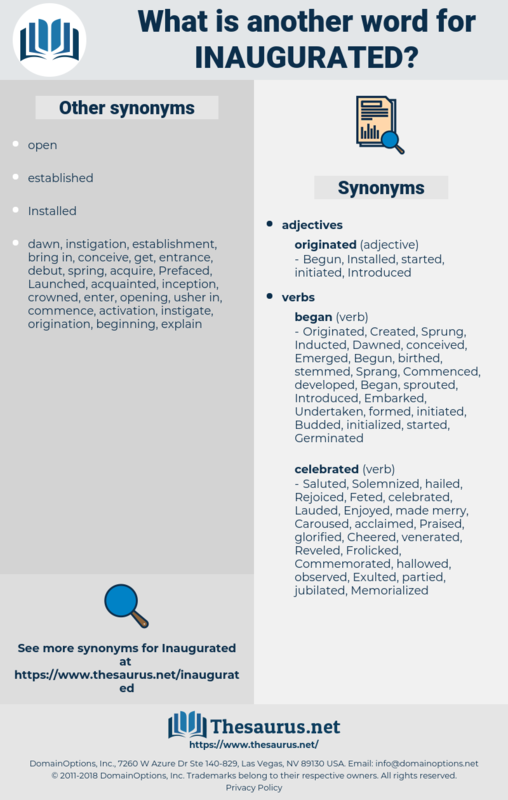 initiated, Instituted, dedicated, Began, reopened, Ushered, Undertook, Embarked, Erected, Entered, Pioneered, Commenced, engaged, started, commissioned, Logged, opened, Launched, inauguration. initiated, institutionalized, Generated, substantiated, Originated, situated, Instituted, Introduced, relocated, dedicated, Installed, initialized, educated, arranged, Created, Inducted, unveiled, Begun, activated, actuated, located, Predicated, Accommodated, constituted, Operated, formalized, triggered, reopened, appointed, establishment, invested, Ushered, Undertaken, Sited, established, Embarked, appropriated, hung, erupted, Constructed, Erected, implemented, paved, Enacted, endowed, prepared, Commenced, Devised, equipped, Convened, sworn, spearheaded, trained, co-created, forged, Ventured, Grounded, Deployed, engaged, positioned, Compiled, Coined, Issued, assembled, co-sponsored, realized, fostered, settled, started, Arisen, unleashed, struck, moved, sparked, built, composed, lowered, unlocked, authored, marked, solicited, Emplaced, shaped, decreed, run, Hurled, expended, Premised, Comprised, Embraced, discharged, sponsored, Achieved, finished, completed, released, Piloted, employed, adopted, Lodged, occupied, mounted, fired, Snapped, vested, thrown, kicked, rolled, commissioned, posed, Fitted, formed, peeled, Offered, booted, Watched, Logged, shot, cast, seated, Carried, possessed, sounded, possession, Housed, seen, founded, placed, blocked, based, opened, Launched. The announcement that in the evening a series of revival meetings was to be inaugurated, had been made at the love - feast, and it was repeated now from the pulpit, with the added statement that for the once the class - meetings usually following this morning service would be suspended. The struggle which he inaugurated began in A. D. 725, when he ordered the removal of all the images in the capital.